Super quick BBQ pasta pot that the kids go mad for! This BBQ pasta pot literally takes minutes to throw together and can be eaten hot or left to cool and packed in lunch boxes. It’s easy, yummy and counts towards the kids five-a-day. Whilst you simmer a pan of pasta quickly slice up some cooked smoked sausage, some red pepper strips and zap some peas and corn in the microwave. Drain the pasta, add the sausage and vegetables, add a big (or little) squirt of BBQ sauce, mix and eat. It’s so easy. Whilst the pasta cooks, zap the peas and sweetcorn in the microwave as per packet instructions. 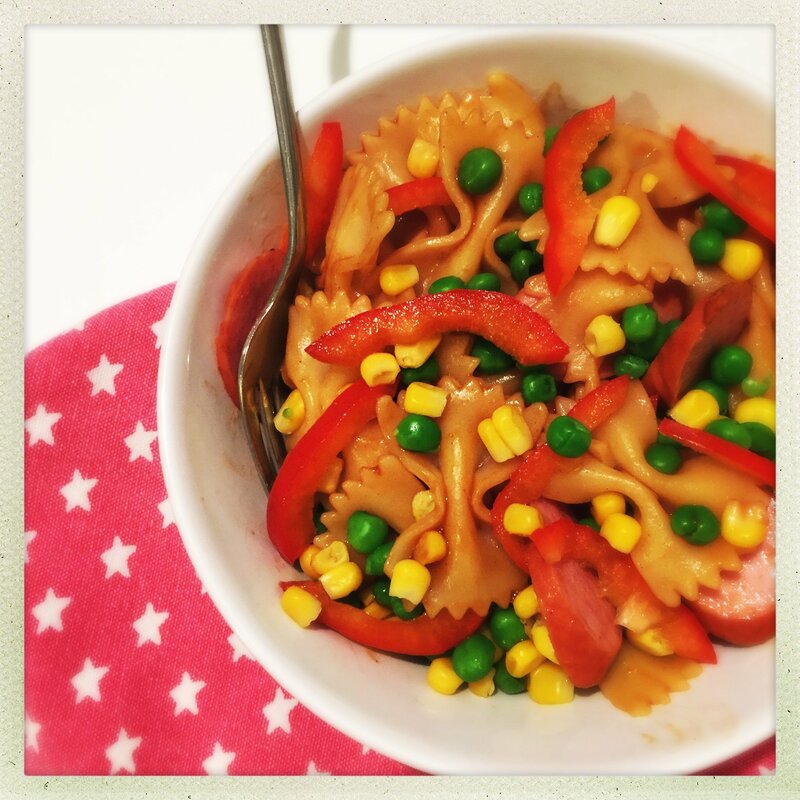 Drain the cooked pasta, add the sausages, peas, corn, red pepper strips and squirt of BBQ sauce, mix together and serve. Use chopped ham or turkey instead of sausage. Go veggie and swap the meat for cubed feta or grated mature cheddar. Any leftovers fab packed in lunch boxes as pasta salad next day.